What are the best camping pots in 2019? Time is a serious problem for most people, and if you can’t spare some of it to search online for the best camping pots, the following short paragraph will give you all the information that you need. After analyzing the camping pot reviews of many of the products on the market, we have concluded that the unit worth getting is the Terra Hiker Camping Cookware. 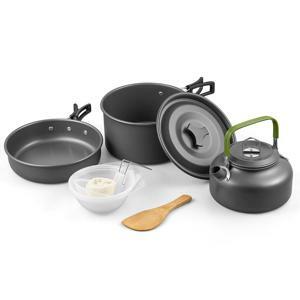 This cookware set includes everything that you need to make your camping session a success. All the pots and pans come with a nonstick coating which will help with cleaning and guarantee even cooking. The set is compact and highly portable and comes together with a nylon mesh bag where you can store all the items. If you find that our first choice is temporarily unavailable for sale, but you are determined to get a high-quality product, we recommend the Winterial Pot Set as it offers similar performance. There are many options out there, and it can be challenging to decide on which one to choose, especially since there are numerous aspects to consider such as the materials and durability, size and types of pots available. We want to help you identify the good camping pots from the bad, which is why we have compiled the following short buyer’s guide just for you. 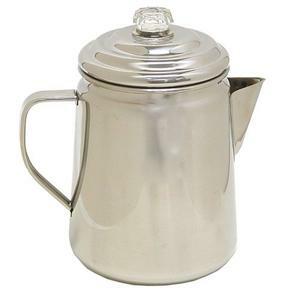 The most popular material used for camping pots is aluminum as it is an affordable choice that is very lightweight to help with transportation and that heats up very fast to cut on the cooking time required for meals considerably. Cheap camping pots are generally made from regular aluminum while the more expensive models use anodized or hard-anodized aluminum. Raw aluminum has the disadvantage of reacting with acid and alkaline food and can change its flavor. 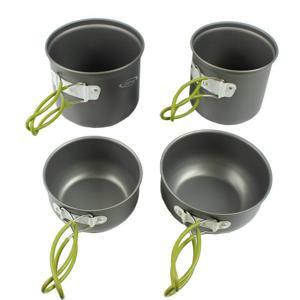 It can also dent quite easily, which is the reason why most camping pots currently available on the market are anodized. Hard-anodized aluminum, on the other hand, features a coating that is up to three times thicker than regular anodizing. Thus, this type is more durable than both raw and regular anodized aluminum, and it manages to remain just as lightweight. The one downside is that this type of material can be more expensive. Unless you plan to camp with a large group, storage space can become a problem, which is why it is crucial to get a camping set that can meet your exact needs. As a general rule, the largest pot in your cookware set should hold around 1 pint per camper in your group. As far as the number and types of pots, this depends a lot on what you intend to cook and how many campers are in your party. One pot is generally more than enough for two campers, but larger groups will require extra pans and pots. You should make sure that your set includes a gripper for all the pots as it can be difficult to pick up your pots and pans safely. If your options don’t have a gripper, you can purchase it separately. Similarly, since there’s nothing like a cup of warm tea near a campfire, most kits will include a teapot. If you ever find yourself forced to choose between two products that offer similar performance, one way to decide is to get the one that offers extra utensils. Many cook sets will come complete with mugs, plates, tools, and even towels. If you are starting from scratch, a complete set will make a very valuable purchase. If you are not yet sure which product to get, we have prepared a short list containing some of the top-rated models currently available on the market for you to choose from. The options you will find below have stood out thanks to their quality, affordability, and reliability. 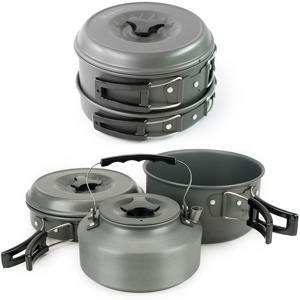 The Terra Hiker set contains all the cookware you need to make your camping experience memorable. You get a boiling pot with a lid, a frying pan, and a teapot, together with extra items that include a serving ladle, plastic bowls, a bamboo spoon, and a cleaning sponge. This comprehensive set is designed to satisfy the outdoor cooking needs of 2-3 people. 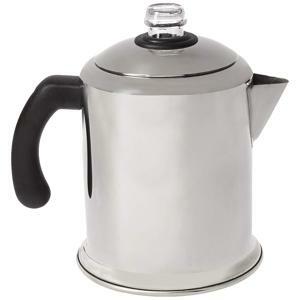 The pot can boil 13.5 ounces of water in only two and a half minutes. All the cookware is made of safe and non-toxic aluminum that features a non-stick coating designed to help make cleaning and cooking easier. The serving ladle and bowls are made from durable food-grade PP plastic. The handles see the use of heat-resistant materials that will keep your fingers safe. The same handles come with an ergonomic design to offer a comfortable and firm grip. The entire set is compactable, and you get a nylon mesh bag to help you pack all the items neatly in your backpack. With a total weight of only 1.5 pounds, this set will make a great addition to the collection of any backpacking enthusiast. All the three pieces are stored together and are incredibly portable which allows for convenient carry, especially for campers who like to travel as light as possible. 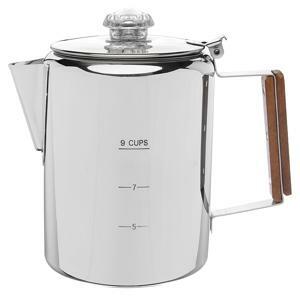 The set includes a large pot and lid, a frying pan, and a tea kettle. What’s more, you also get some extras in the form of a personal bowl and serving ladle, a serving spoon/spatula, a cleaning sponge, and a carry bag. The pot, pan, and tea kettle are made of light and solid aluminum oxide, which is very durable and high-temperature-resistant. The pieces also feature a Teflon coating to help with the cleaning process as well as increase the durability of the cookware. The set can meet the cooking needs of 2-3 people. Customers were delighted with the performance and quality of this option, especially with how fast it manages to heat water and cook food. The G4Free Outdoor Kit is an affordable option that seeks to give outdoor enthusiasts the pots they need to cook their favorite meals in a compact and easy-to-carry format. The set includes two boiling pots and two frying pans together with a mesh bag that you can attach to your backpack for easy transportation. This set is suitable for 1-2 people, and when the cook set is fitted together, it contains enough extra room inside to carry matches, seasoning, a cleaning sponge, and utensils to keep your space usage to the bare minimum. The pans and pots are constructed from FDA approved non-toxic anodized aluminum which is built to last as well as help you cook quicker and more efficient. Both the pans and pots come with folding handles for increased compactness, and when not folded, the handles will remain cold to the touch even when pan or pot is hot. When it comes to mattresses, it’s a well-known fact that comfort is the key aspect that should be taken into account. 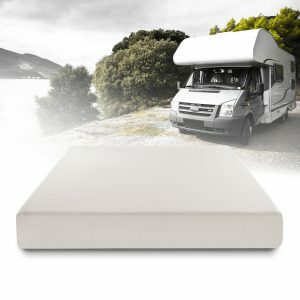 However, Zinus’ Ultima Comfort model does take this one step further, given that the manufacturer included in its construction one of the latest evolutions, namely a bio foam. This replaces some of the traditional petroleum with a natural plant oil which helps keep the mattress fresh. What this translates into is a comfortable and highly-qualitative sleep for the user, which means increased productivity throughout the next day. You can only imagine why this feature is placed at the top of our preferences. The manufacturer offers three different types of firmness for this model: soft, medium and firm. This is a good thing since you can choose the one you prefer, but on the other hand can also be quite tricky if you place your order but you don’t know which alternative to go for or, as it has happened in certain cases, that buyers were not even aware of the different options. If you have any questions on the level of firmness that you should go for, you can always contact the manufacturer for further information. 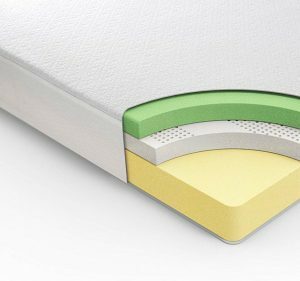 Known for being a pioneer when it comes to comfort innovation, Zinus developed this 8-inch memory foam mattress in such a way that it offers the full necessary support thanks to its high-density foam base layer. This is also the one that ensures lasting durability and stability, meaning you’ll be able to enjoy the mattress for quite some time. The memory foam layer molds to the natural shape of your body for an increased level of comfort. All of these foam layers work together to ensure a great overall experience and a refreshing night’s sleep. 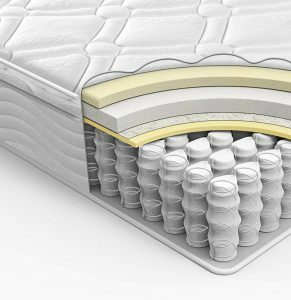 Although we’ve already talked about the different layers, it’s a good idea to take a closer look and understand the way this mattress is actually made. Its construction includes the 2-inch memory foam, a 2-inch pressure relieving layer, as well as the 4-inch high-density base support foam. Compared to other mattresses in this category, it’s good to know that only the ones using the highest quality foam receive the CertiPUR-US Certification for durability and performance. The Ultima Comfort does check this box, so you can safely give it a try. 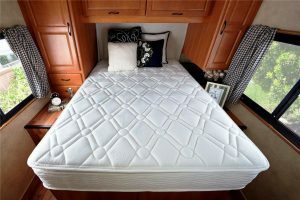 Since a mattress is not something that you can easily carry around, the manufacturer came up with a solution for this. Its patented technology allows the item to be efficiently compressed and rolled in order for it to be conveniently shipped to your door. You also won’t have too much trouble carrying it around the house all the way to its chosen spot before getting it open. As you can very well imagine, once this is done, you won’t be able to move it around that easily, so this smart shipping packaging can definitely come in handy. 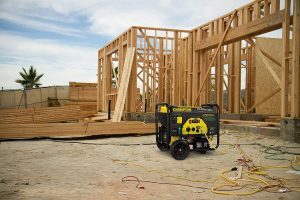 One of the crucial aspects of a high-quality generator is its running time since this can make a significant difference in the user’s experience, by providing more or less reaction time in case of a power outage or emergency. 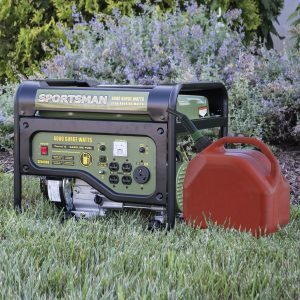 For this reason, the fact that Sportsman’s GEN4000 model is a recoil start unit that can run for up to 10 hours, all of this with a 50% load on 3.6 gallons of fuel, then you can only imagine why we’ve considered this feature as the one that makes it special among others in its category. Given the 91 pounds it weighs, moving it around is a two-person job, so don’t think that you will be able to accomplish this on your own unless you have a truly impressive physical force. However, if you don’t, you might want to make sure that there’s someone there to help you place it in the spot where it’s needed. 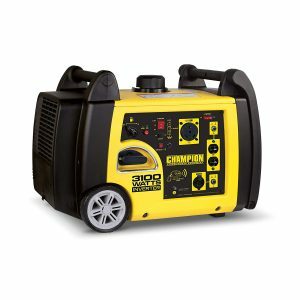 What makes a generator such a useful addition for your home or RV is the fact that you can use it to power many appliances and devices. However, in order to do this, it needs to be compatible with more than one outlet. 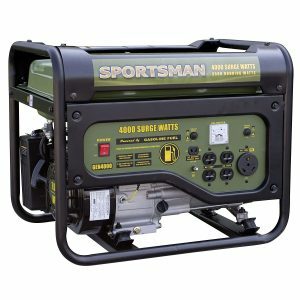 The good news about this Sportsman generator is that it surely fits the bill. 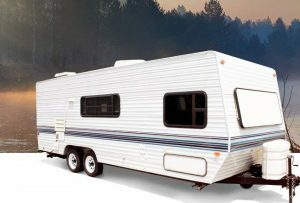 Equipped with four 120-volt outlets, a 12-volt DC outlet for battery charging, as well as with a 120V RV outlet, this is the right choice for either that nice weekend getaway you’ve been planning for quite some time, or for ensuring a quick response in case there’s some temporary power loss or emergency situation. 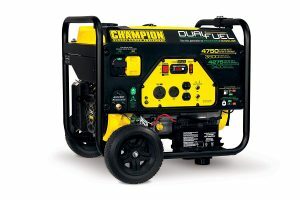 Since you need to keep this unit ready to be used at any given moment, the fact that it’s powered by unleaded gasoline is a convenient aspect. This also means you’ll easily find the right fuel source, even if you are not in an area you are particularly familiar with in terms of gas stations. What this also means is that you can easily travel across longer distances and not fear that you’ll need a particular type of fuel that might not be available. For this reason, this model proves to be a trustworthy partner in your long-distance adventures. 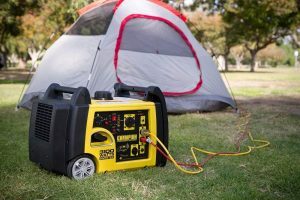 It’s true that generators might not be perceived as the most silent items that you can have around your home or camping site. However, given this model’s 91 pounds weight and 4000-watt power capability, we think that the decibel operation rating of under 69 dBA is a decent one that you will not perceive as being unbearable. It’s true that if you are out in the wild, sounds can seem even louder, but even in these conditions, we are pretty sure that you will be pleased with this generator’s operating sound level. The main advantage of this item is perhaps the fact that it doesn’t require any particular skills or complicated tools to be applied. It’s a one person job maximum, and it can be done in a couple of hours with the help of a few basic items. Also, remember to carefully clean the roof before you start applying this substance because there should be no dirt or debris left behind. You can now give your vehicle a new, fresh face and change its aesthetic with an affordable roof sealant that also does a great deal to protect the interior space. 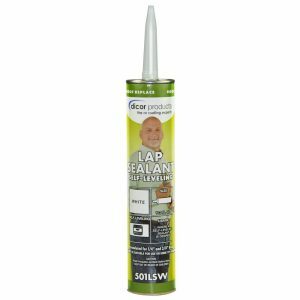 There have been complaints saying that despite being a good product, the main drawback of this sealant is the fact that it requires a lot of preparation, so it’s not as easy to use as most customers would think, at least according to the manufacturer’s description of it. However, that’s true of any item like this, because you need to make sure that the surface of the roof is clean and as even as possible before going on to apply a sealant, otherwise it won’t reach its purpose. 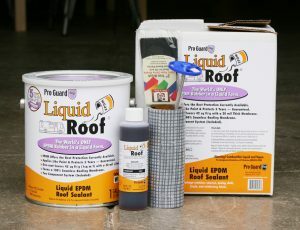 If there’s any old roof coating left from the last application you should do your best to get rid of it. The role of a good RV sealant is to protect the roof from various harmful external factors such as water infiltrations, but this one does a lot more than that. First of all, it provides a flat, aesthetic surface that you can apply other layers on top of. It’s compatible with a wide range of different surfaces, which makes this product an excellent choice for customers who own more than one vehicle or who are not sure what would be the best choice for the type of material that their roofing is made of. Materials that work well with this product are, for example, aluminum or other metals, which is pretty typical for medium-range priced RVs. Another purpose that can be easily achieved by using this sealant is that of giving a new look to an overused vehicle. It’s true that the roofing is the part that is perhaps less noticed by the pedestrians, but that doesn’t mean that you shouldn’t try to create an aesthetic surface. This product will develop a flat surface that is good-looking on its own, but due to its texture, it will give you the opportunity to apply several layers on top, such as a coating of paint for example, which would drastically change the entire aesthetic of your vehicle. Of course, we recommend, if you do choose to paint it, that you do so in a bright color, preferably white because otherwise, you will attract the sun rays and the temperature inside will significantly increase. According to the customers that have tried this product and reviewed it over the course of time, it’s evident that it has good value for the money. 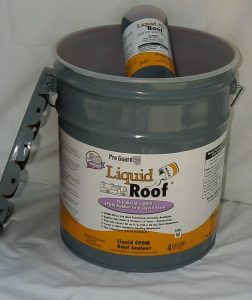 You can use it to cover the entire surface of an RV roof with one layer, and you would still have liquid left in the container. That’s great because if there are certain areas that require a slight touch-up, you can use the leftovers to go about it discreetly and no one will notice the difference. After you’ve used this RV roof sealant on your vehicle, there will be no signs of cracking or peeling, which is essentially the primary purpose that it should reach. A suitable sealant must protect the roofing from harmful exterior factors such as weather conditions and excessive rain that can cause leaks. However, by using this product you avoid this unpleasant situation, because not only does it create a stable horizontal surface for the roof finish but it also manages to keep dirt and humidity out while maintaining a bright, polished look. There have been complaints from some customers saying that it sometimes takes too long a time for the bubbles to flatten out. If you do not let this product sit, the rubber might react, and bubbles might appear while it’s curing, which can affect the overall quality of the layer that will be left behind. However, you can avoid this effect by taking care of the environment that you work in. Applying this sealant in the correct temperature conditions and respecting the manufacturer’s instructions should save you from having to deal with these sorts of issues. 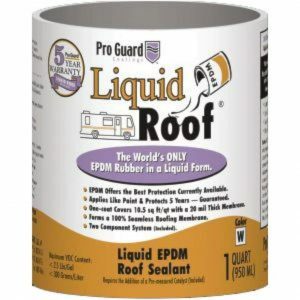 This sealant comes in the form of EPDM rubber, one of the most common materials used for this type of product. However, it does come in liquid form, so this is what makes it easy to apply without having many professional tools to perform this task. You don’t need to put in that much effort, and the end result is a lot more even and perfected than it would be if you would use other alternatives. You can get everything covered and sealed with just a one-layer application, and you won’t have to worry about water leaks or dirt. Another essential aspect when it comes to this product is the surface that you can cover using just one container of the substance. According to the instructions from the manufacturer, one packaging should be more than enough for 42 to 46 square feet, given that you use one coating as it was recommended. That should be more than enough to cover the roof of your RV with one container, so you can also say that this item has good value for the money, especially considering the fact that you won’t have to reapply the formula to ensure its efficiency. There have been many reviews from satisfied customers saying that they enjoyed this product and that most importantly it manages to recoat the roof of an RV and give it a nice, polished look, but simultaneously keeps the dirt, debris and water infiltrations out. You can use it to refresh the look of your vehicle or just because you need to perform a cleaning routine, but make sure that you get rid of any residual waste on your RV roof before you apply this formula because otherwise, it will affect its composition and its efficiency just the same.